Stephanie Peters was born near Baltimore, Maryland. She spent her early childhood living on an Arabian horse farm in Harford County, Maryland. She grew up running around open fields and raising animals, including her three goats. During her adolescent years, she lived in the Washington D.C. area, and took full advantage of the free art museums and galleries of the region. Inspired by the work of Robert Rauschenberg and Alexander Calder, she began painting and drawing. She went on to complete a B.A. in Art History and Studio Art at The University of Arizona, in Tucson in May 2009. 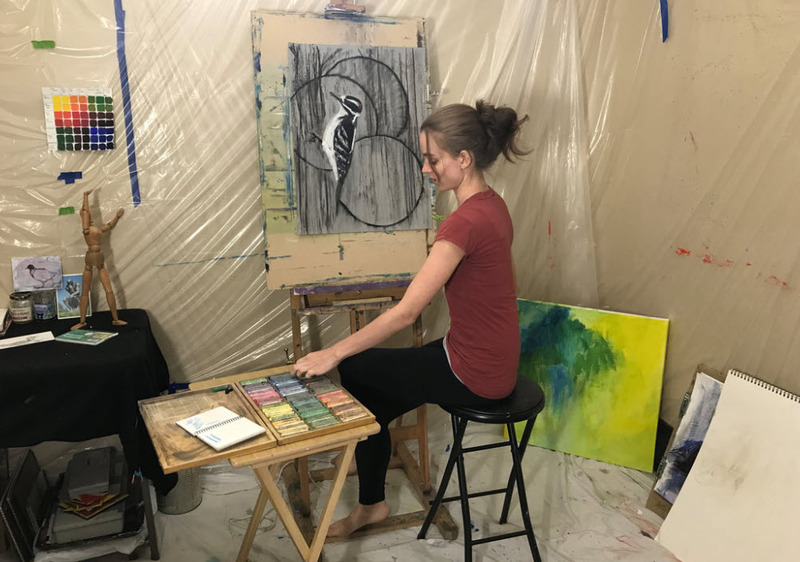 After graduating, she spent several years traveling and finding her artistic voice. With a strong interest in nature and open spaces, she moved permanently to Arizona in 2011. Peters has found inspiration in the natural world since childhood. She has traveled to interesting places to have firsthand encounters like hiking with a herd of Desert Big Horn Sheep in Zion, UT, watching Greater Flamingos near the Camargue, France, or snorkeling with sharks in the Dominican Republic. These adventures regularly inspire new work she creates on location and in her studio. In addition to her interest in animals, she also finds inspiration in the landscape and through natural processes such as volcanic eruptions. Her personal experience with natural cataclysms has been a recurring theme in her abstract work. Her original paintings on natural disasters were a response to the increasing severity of these events over the past ten years, and societies reaction to them. Her new work takes a closer look at the changing Earth, through natural catastrophes and their role in ecosystems. In 2013, she was juried into Verde Valley Land Preservation’s ‘A River Runs Thru Us’ traveling art project that brought awareness to the Verde River. Her series on Natural Disasters was featured in the 2013F issue of Brand, an international art and design magazine, and the Natural Hazard Observer (2015). She was invited to be a guest speaker for Yavapai College’s OLLI Inside Creativity, and in 2014, she was invited to speak on an artist panel at Menlo College, California. Her work was featured in articles for Prescott Kudos (January 2015), the Village View Sedona (April 2015), and MISC Magazine (Fall 2015.) In July 2015, she spoke on a panel at the Natural Hazard Conference, hosted by the University of Colorado, for her series about Natural Disasters. In October 2015, she was the artist of the month for the Powell Museum, in Page, AZ. She has taken part in juried exhibitions throughout the United States, and recently, her wild fire series was featured in the Maricopa Audubon Fall 2017 Wren*dition. Her work is in private collections worldwide. She currently exhibits at the Grotto Gallery in Tempe, Arizona, Canyon Café in Phoenix, Arizona and online. When Stephanie is not in her studio creating art or running her graphic and website design business, Speters Designs, she is traveling and finding something new to be inspired by. Her current and past work can be found at www.stephartist.com.